More fun from Spring 2012 Quilt Market! I had the chance to spend some time with two of my dear friends, Pat Sloan, who has a great new line of fabric with Moda called Eat Your Fruits and Veggies, and Liz Johnson from Sew4Home, one of the gurus behind awesome site. I wish we could have spent more time together! Denyse Schmidt's booth was one of my favorites. Denyse was there to show her new line of fabric for FreeSpirit called Chicopee and it is so lovely. It's got this 70s Americana theme in two colorways, and in addition to quilting weight cotton, there will be six fine-wale corduroys. Denyse showed me a swatch of one of them--it's super soft and has a gorgeous hand. Denyse's booth was constructed to look like her studio, complete with design wall and inspiration board, and plenty of quilts hung on antique ladders. The quilts were from her new book Modern Quilts, Traditional Inspiration and it was such a treat to see them in person. 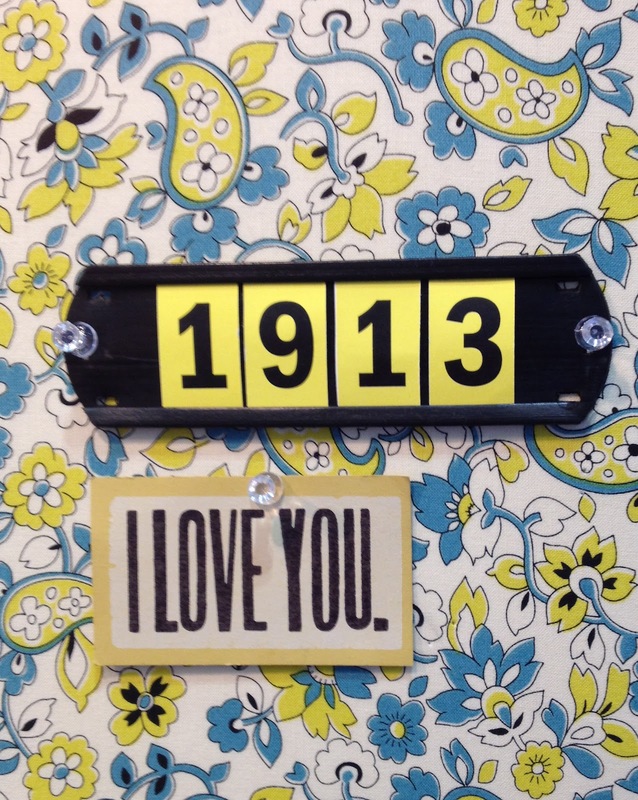 And I loved this detail in Denyse's booth, which was number 1913. Next up is Amy Butler's gorgeous booth featuring her new line of fabric called Cameo. So stunning. I just love how sophisticated her booth was. Cameo is full of lovely blues and greens with some fun pops of coral and pink. Five prints from Cameo will also be available in voile but at a smaller scale than the quilting cottons, and there are four laminated prints. I love how Amy incorporates so much ephemera in her booth to help tell the story of her designs. From the huge printed backdrops to the tiniest vase on the table, no detail is missed. Next up is Cocoon by Valori Wells. I think this is my favorite line of hers yet. It's full of gorgeous florals and butterflies that I think will certainly appeal to girls of any age. I know my Olivia will love it and I need need to pick up some soon. Valori also produced prints on a linen cotton blend which has a gorgeous drape. She made a skirt out of the yellow butterfly print and it was amazing! And speaking of amazing, here is Anna Maria Horner's booth, featuring her new line, Field Study. The scientist in me (I started college as a pre-med major and ended up with a minor in Chemistry before switching to Art History) loves the fact that it was influenced by things like swarming moths, global bird migration, and plant DNA slides. How cool is that? And, as usual, Anna Maria's use of color is stunning. Next up is Melody Miller's booth, which was so adorable. I love Melody's sense of style and she does it again with Ruby Star Vinyl for Kokka. The records are so fun! Melody was kind enough to share some of her typewriter fabric with me too and I can't wait to use it! One of the best parts of being at Market is the random things that happen, like this impromptu book signing by Jacquie Gehring of Tallgrass Prairie Studio of her new book, Modern Quilting, for Rashisa Coleman-Hale of I Heart Linen (and using Rashida's back to steady herself), right on the convention room floor. And of course, the fun continues late into the night...Here's Scott of BlueNickel Studios and GenQ, Debbie of Esch House Quilts, and Brenda of Pink Castle Fabrics. And back to the floor! Bari J, whom I love, one an award for best booth which features her LillyBelle, her new line for Art Gallery fabrics. We just happened to be walking by Bari's booth when they announced that she had won, so I snapped a few photos of her with her blue ribbon. LillyBelle is such a gorgeous line of fabric, and I really think it's Bari's best work yet. There are beautiful florals that are her signature style, and also some really nice graphic prints including a chevron and a rattan print, which is one my favorites. Bari has also released a new line of patterns, including some adorable children's wear patterns that were designed by Suzy of Suzy-Homemaker. I can't wait to see what else those two come up with! There was a lot of buzz about the new quilting weight fabrics by Liberty of London. They are so gorgeous and I can't wait to work with them. I picked up a fine-wale corduroy tote from them at the show, and they were kind enough to send me a charm pack of all of their new line as well, so I'll be sharing more about them soon. And I was so glad to finally get the chance to meet Alexia Abegg of Green Bee Patterns at Market. Her patterns are adorable and her booth was so cute and bright! And I really loved her button covered sewing machine! Michael Miller's booth was circus themed this year. If you look closely at the photo above you can see tents, and if you look even closer, you'll see some elephants way in the distance. They never go half-way in their designs! I loved this quilt that was made by the Portland Modern Quilt Guild, using Michel Miller's new line of Couture Cottons. And I'm so bummed that I didn't get more photos for you. Things were crazy at Market, but in a great way, but I realized after I got home that there were a bunch of things I missed. That gorgeous yellow fabric above is by Violet Craft from her second line for MM called Madrona Road. It's beautiful! Here is Sarah Jane's new collection for Michael Miller. It's called Out To Sea and it's full of sweet little mermaids, pirates, narwhals, and even pirate girls. It's completely adorable! And last, but not least, for today, here are some shots of Cloud 9 Fabric's booth. I especially love their new line Happy Drawing by Ed Emberley. It's so fun! Whew! And that's still not all! I'll have even more to share from Market in the next couple of days. Love all the photos; thanks for sharing! I think my favorite booth is Amy Butler's. But that's only from photos.